WiBotic provides wireless charging and power optimization solutions that are integral to charging the rapidly growing ecosystem of aerial, mobile, marine and industrial robots. Our patented Adaptive Matching technology is built into every system, improving upon established methods for magnetic resonance and inductive power transfer, to provide the power levels and increased antenna range drones and robots demand. WiBotic power optimization solutions enhance our core wireless power technology by adding detailed battery monitoring and reporting, and configurable charging parameters – all available through APIs and WiBotic software. Combined with strategic deployment of the wireless charging hardware, these software features fully optimize the uptime of entire robot fleets. With WiBotic, robots no longer need to leave the work area to periodically plug-in or recharge at contact-based charging stations. In fact, the notion of centralized charging stations is obsolete when wireless power is used to electrify an entire facility – allowing fewer robots to do more work. Wireless power transfer (WPT), in general, was first observed in experiments by Michael Farraday and Nikola Tesla in the 1800s. However, the ability to transmit power reliably, efficiently and at the high power levels required to drive large devices, was not developed until the early part of the 21st century. Today, several forms of WPT exist. The most common is inductive charging – as typically found in consumer devices such as cell phones and electric toothbrushes. Unfortunately, inductive systems are only efficient when the antennas are extremely close. Robots, drones and AUV’s can’t position themselves accurately enough to ensure inductive systems will provide a reliable charge. Magnetic resonance is a newer technology that offers much more flexibility in positioning. However, typical resonant systems have a “sweet spot” where efficiency is maximized. As long as the robot can navigate to that exact spot every time, maximum efficiency can be achieved. If the robot stops short or is off-center, however, efficiency is reduced and charge times increase. This may be acceptable for some applications where very small amounts of power are used, but not for larger devices such as robots, especially entire fleets of robots. 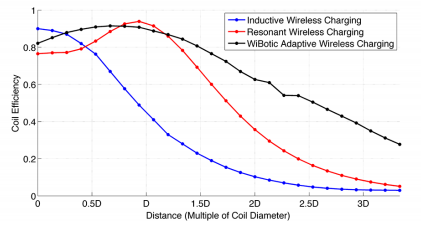 Based on more than eight years of research at the University of Washington, WiBotic technology builds on the strengths of both inductive and resonant systems by incorporating the best of both. Our patented Adaptive Matching system constantly monitors relative antenna position and dynamically adjusts both hardware and firmware parameters to maintain maximum efficiency – delivering reliable charging, at high power levels, and across several centimeters of vertical, horizontal and angular offset. That’s the secret sauce! With WiBotic, robots can opportunity charge while being productive and maximizing uptime. WiBotic power optimization solutions, which include firmware, software and cloud-based services make it easy to optimize a highly scalable power management scheme for your entire fleet. Sophisticated software manages all charging functions autonomously to ensure the desired charge current is maintained regardless of robot docking position or movement during charging. How does your fleet know when to charge? What happens if a battery fails unexpectedly? How much does downtime actually cost? All of these questions can have major implications on the scalability of fleets, and we can help. WiBotic power optimization software brings a new level of intelligence to fleet management. Embedded robot identification and communication systems allow for a many-to-many architecture, where any robot can charge from any station, even if the robots have different battery chemistries, voltages, and charging rates (amps). System settings are also configurable through WiBotic APIs. The “Network API” allows computers on the same network as the transmitter to monitor charging and set desired charging parameters. For example, operators might integrate robot scheduling systems to be sure robots are charged at the highest available power level during the day when multiple missions are required, but more slowly overnight so battery lifespan can be maximized. Our “Onboard API” allows the robot or drone controller to access the Onboard Charger directly to perform the same functions. 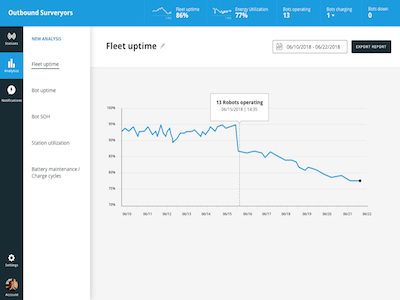 Finally, new software and services from WiBotic will soon provide fleet-wide energy utilization analytics as well as individual battery charging recommendations based on the age and performance of every battery in the fleet. You’ll always know the exact State of Charge (SOC) for every battery. Coordinated networks of wireless charging stations allow robots to stay charged, minimizing downtime and reducing the overall cost of robot fleets. Once configured, the WiBotic wireless power system is fully automatic and highly intelligent. The fleet-level architecture allows several robots to share the same charging station (one at a time) or one robot to move between multiple stations. The Transmitter Unit uses any available power source (AC or DC) to generate a high frequency wireless power signal. The signal travels through a coaxial SMA cable to the Transmit Antenna Coil where it generates both electrical and magnetic fields. The coil can be mounted vertically in a wall station, horizontally in a drone landing pad (or floor mat), or in just about any other orientation to make it convenient for the robot as it arrives for a charge. The Transmitter Unit recognizes any incoming robot equipped with an Onboard Charger Unit and Receiver Antenna Coil and automatically ramps up to deliver the right amount of energy. Conveyed through air, water or other non-conductive materials, the energy is then collected by the Receiver Antenna Coil on the robot and conveyed to the Onboard Charger. The Onboard Charger converts the signal back into a DC voltage and controls battery charging functions to safely replenish a wide range of batteries. To deliver wireless power, the Transmitter first checks to be sure a robot is within range. The system is so flexible that even robots with completely different battery voltages can share the same Transmitter Unit. It automatically recognizes each robot and adjusts charge parameters accordingly. The components allow for extremely effective charging station deployment. The stations deliver power opportunistically to keep robots topped off and operating for long periods. This is much better than the outdated “full drain and recharge strategy” seen elsewhere.